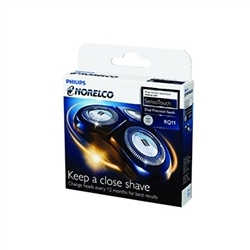 Norelco shavers are known worldwide for their ability to shave closely, and have offered top quality construction since their introduction decades ago. RQ11 replacement Senso Touch 2D series shaving head can restore top performance to your electric razor with little effort thanks to their easy-to install design, click off, click on design. Patented Lift and Cut blades are able to shave facial hairs below skin level by first gently lifting the hair, and then cutting it. Once cut, the hair retracts slightly below skin level, thus giving you a closer-than-a-blade shave. RQ11 Sensotouch head features Aquatec seal for comfortable shaving wet or dry! Innovative head design which features both slots and holes in the comb portion of the head. 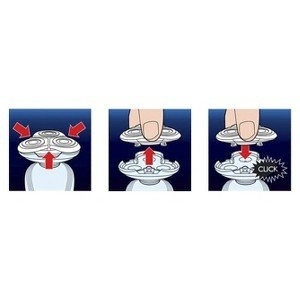 This allows for an improved ability to shave hairs growing in different directions. Norelco shaving heads sharpen themselves as they run, but after a time (typically 12 to 18 months), they can begin to dull. You may notice that it takes longer to shave, that you have to move the shaver in more directions, or that it feels like the hairs are being pulled. These signs are a clear indication that it is time to replace your worn head unit with a genuine Norelco RQ11 replacement shaving head. Philips Norelco RQ11 head unit fits the following shaver models: 1150X 1160X 1160XCC 1180X. Remington Replacement Shaving Heads SP390 Remington Replacement Shaving Head SP96 Remington Replacement Shaving Head SP29 Remington CC100A Shaver Cleaning Solution - 9 Oz.